The Takam Mising Porin Kebang (TMPK) today warned of dire consequences if the State Government insists on evicting the indigenous Mising people living on the bank of the Brahmaputra in Sonitpur district in the name of sixth expansion of the Kaziranga National Park (KNP). 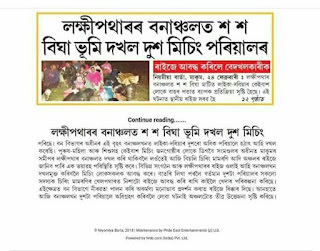 The students’ body said in a statement signed by its president Johan Doley, general secretary Indra Kumar Chungkrang and publicity secretary Rahul Loying, alleged that the State Government has been hatching a plot to settle the suspected Bangladesh nationals in parts of the national park between Jakhalabandha and Bagori, along the National Highway. And to facilitate this illegal settlement, the Government has now served eviction notices on the indigenous people of 18 villages under Bakoridoloni Gaon Panchayat, Bartamuly Gaon Panchayat and Rawnamukh Gaon Panchayat in Sonitpur district, it said.The Government is turning a blind eye to the rapid encroachment in the Orang National Park and the Pabitara Wildlife Sanctuary. Under the very nose of the Forest Department of the State Government, encroachers belonging to doubtful nationality have eliminated the Laokhowa Wildlife Sanctuary.But, while all these are going on unabated, the State Forest Department has asked about 10,000 indigenous Mising people living in the above villages since time immemorial and who have been paying land revenue since 1947, to vacate their land measuring about 15,000 hectares for facilitating sixth expansion of the KNP. If the Government has any plan to save the KNP, it should go for operations to evict the encroachers of doubtful origin from the National Park and also to protect the park’s land area from the erosion of the Brahmaputra, said the students’ body. It has demanded immediate revocation of the proposal for forth and sixth expansion of the KNP. As, it said, these would affect the indigenous people of the State. Or else, it warned that it would resist any attempt at implementing the above expansion programmes.